Has your browser got you down? Are you sick of wrestling with Internet Explorer, Chrome, Firefox, Safari, or whatever program you use to access the Web? If all of your life's problems stem from browser annoyances, I probably can't help you--but I can give you some quick and easy fixes for common browser issues. Here's how to find a missing URL bar, sync your bookmarks across multiple devices, keep your passwords handy and secure, and save seemingly unsavable images. Maybe you clicked a bunch of things you shouldn't have, or maybe your cat jumped on your keyboard, because now you can't seem to find your URL bar. In Internet Explorer, right-click any toolbar and check Address bar. If you're using Internet Explorer 9, you'll always see the address/search bar, but older versions of IE have the option of hiding it. In Firefox, go to View, Toolbars and check Navigation Toolbar. You can also right-click any toolbars you do see, and check Navigation Toolbar in the drop-down menu. In Safari, hold down the Command (Ctrl if you're on Windows) button, the Shift button, and the Backslash (\) button. The URL bar will reappear. Xmarks can sync your browser bookmarks across different browsers and PCs. Syncing bookmarks is incredibly simple, thanks to the free cross-browser syncing software Xmarks (formerly FoxMarks). Xmarks stores your bookmarks on the cloud, so you can access your personal bookmarks from any computer. You can even create different bookmark profiles, such as "Home" and "Work." To use Xmarks, first download and install it (the tool works with Internet Explorer, Firefox, Chrome, and Safari). If this is your first time using Xmarks, and you don't have an account or any bookmarks saved to the cloud, it will prompt you to create an account and sync your bookmarks from your computer. However, if you already have an account and you are installing Xmarks on a new computer, it will prompt you to synchronize your bookmarks from a profile. If you have bookmarks that you want to save on your computer (as well as bookmarks from your cloud profile), make sure that Xmarks syncs all of them by merging your local and server-based favorites first. Sometimes you're just too lazy to reach all the way across your desk and grab your mouse--so why not open a new tab by using a keyboard shortcut instead? Here are a few keyboard shortcuts that will improve your browser productivity. Alternatively, you can control your browser just by moving your mouse. To do so, download a free mouse gestures add-on for Internet Explorer, Firefox, Chrome, or Safari. BugMeNot can get you around websites that require you to register (though not around paywalls). Registering for websites is a pain in the neck, even if you use a dedicated spam email address to cut down on ads. Sometimes you just want to watch a cat video and be done with it. Here's a quick, easy workaround to having to register each time you end up at a new website: Turn to BugMeNot. 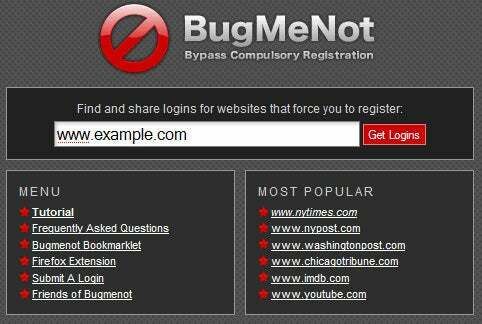 BugMeNot has a database of legitimate usernames and passwords for various sites that require you to register in order to access content. You can use BugMeNot in several ways. The simplest approach is to go to the BugMeNot website and enter the name of the site where you want to log in. BugMeNot will produce a list of usernames and passwords that you can use instead of registering yourself. If you'd rather not go all the way over to the website each time, you can download an extension for Firefox (BugMeNot Firefox) or Chrome. On other browsers you can use a bookmarklet (located in the menu of the BugMeNot website; just drag the bookmarklet into your browser's bookmark toolbar) to get instant BugMeNot login credentials. BugMeNot does not give out credentials for sites that are behind a paywall, however, so you can't avoid paying for content by using this service. Ads aren't just annoying and pervasive--they increase Web-page load times, and they can eat up your data plan if you're on a tethered or otherwise monitored connection. Browsers today usually include a generic pop-up blocker, so you're unlikely to be bombarded with pop-ups, but you'll still see other ads, most of which are images. Luckily, getting rid of them is as simple as downloading an ad blocker for your browser. Internet Explorer users should take a look at Simple Adblock, Firefox users can pick up the Adblock Plus add-on, and Chrome and Safari users should check out Adblock for Chrome and Safari.